Rome wasn’t built in a day, and you certainly can’t experience it all in a day or even 3 days. Maybe just a taste, because come on, part of being in Italy is the food, right? 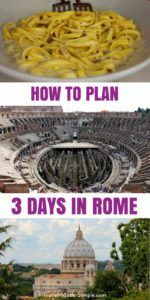 Three days in Rome is enough to see the big sites, experience some of the best things to do in Rome, have a few tasty meals along the way. 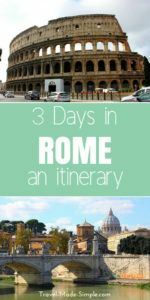 We’re here to help you out with our Rome itinerary so you’ll know what to do in Rome in 3 days. Even still, this is Rome, the eternal city, the largest city in Italy, and the center of the ancient Roman Empire. There is enough history, ruins, museums, and monuments to keep you occupied for a while, especially if you take things slowly. 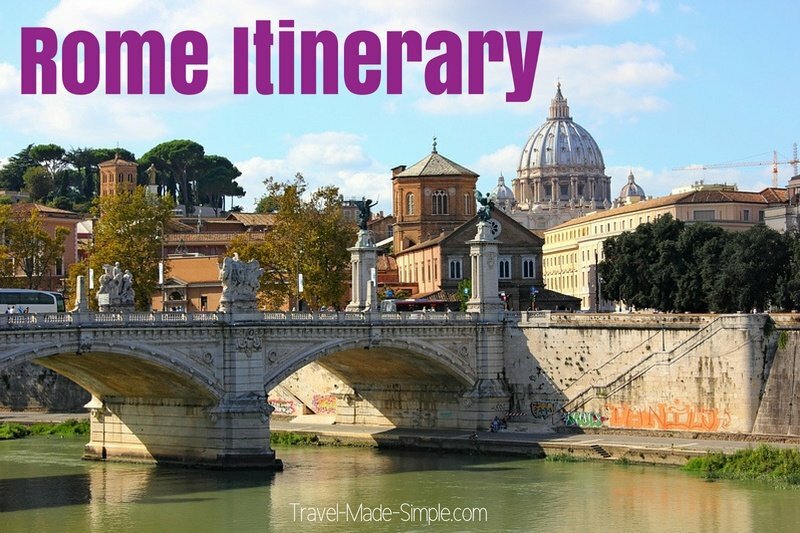 Here is an itinerary for 3 days in Rome to get you started. 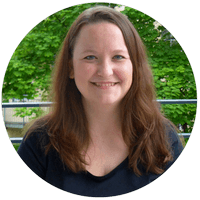 It is very similar to one that we have personally done. Have 4 or 5 days for Rome? Italian food is delicious, but did you know it’s very regional? And some dishes that we think are Italian actually don’t exist in Italy! Food tours and cooking classes are great ways to learn about the rich food culture in Rome. You’ll get to taste a variety of local foods, try your hand at pizza or pasta making, and learn how to spot authentic gelato. We hunt for food tours in every city we visit. Rome was where this habit all began for us. We like that food tours show a different side of the city and usually a list of places to eat and we try to do them on the first day. I highly recommend including a food tour on your Rome itinerary. I think food tours are some of the most fun things to do in Rome. 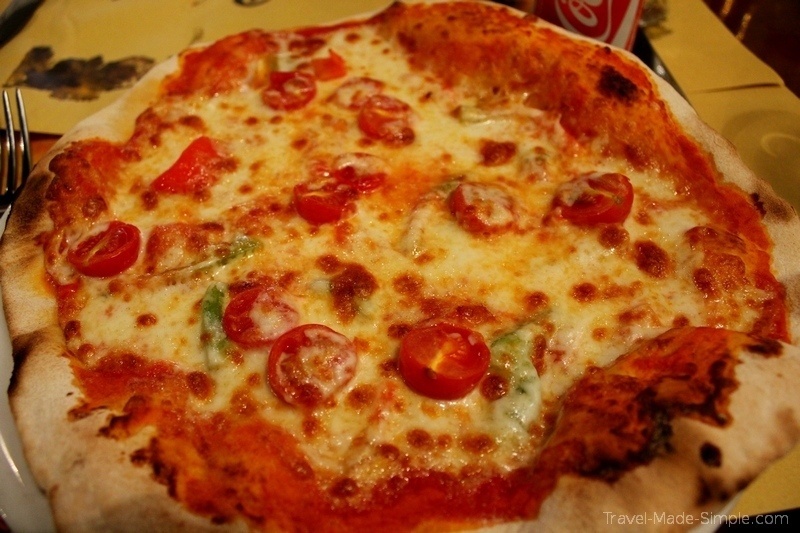 We’ve taken two different Rome food tours, and both were excellent. Each of these tours starts in the mid morning and end around mid afternoon. This leaves you plenty of time to see some more sights after. This one in the neighborhood of Trastevere lets you taste a variety of dishes, such as porchetta, pasta, pizza, gelato, and more. This one in the center near Campo Fiore lets you dive deeper into each of a few types of Italian food and compare them. Vinegar, olive oil, salami, cheese and more, plus you get to make your own pizza at the end. Trying to decide? Read my comparison of these two Rome food tours and decide which one is right for your Rome itinerary. Read more about picking the perfect food tour and how to prepare for a food tour. Regardless of which tour you pick head into the center to explore the streets of old Rome. From Trastravere, take a tram ride to the center. Explore Plaza Navona with the fountain of Neptune or the Pantheon building. Walk off all of the food from the morning. The inner city of Rome is walkable, but it can be bigger than it seems, especially in the heat. Make sure you get a map. At some point during your days here, you will probably want to see the must see places in Rome that everyone sees. Trevi Fountain and the Spanish Steps are two of them. By all means go and enjoy, but be ready to deal with large crowds, so have patience. 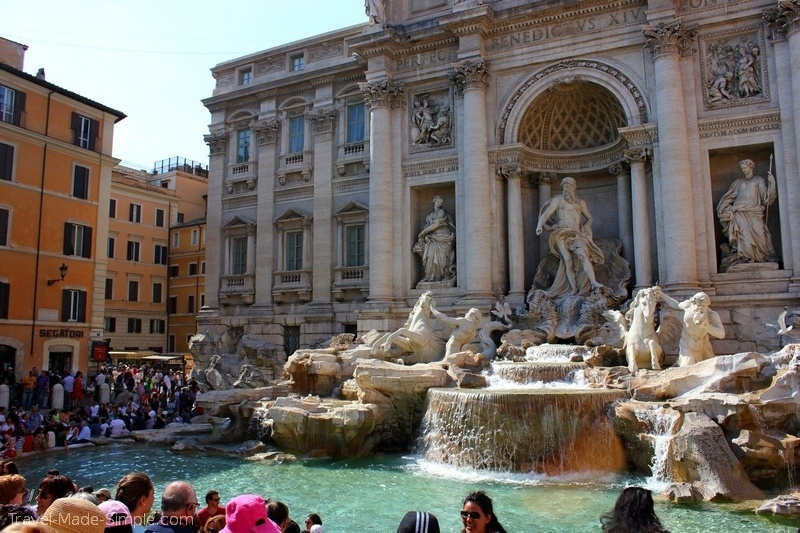 There are fountains all over Rome, which add to the charm and atmosphere of the city. But the most famous one of all is the Trevi Fountain. Legend has it that you will return to Rome if you throw a coin over your shoulder into the fountain. Plus the money is collected and donated to a local charity. These gorgeous stairs are named for the nearby Spanish Embassy. 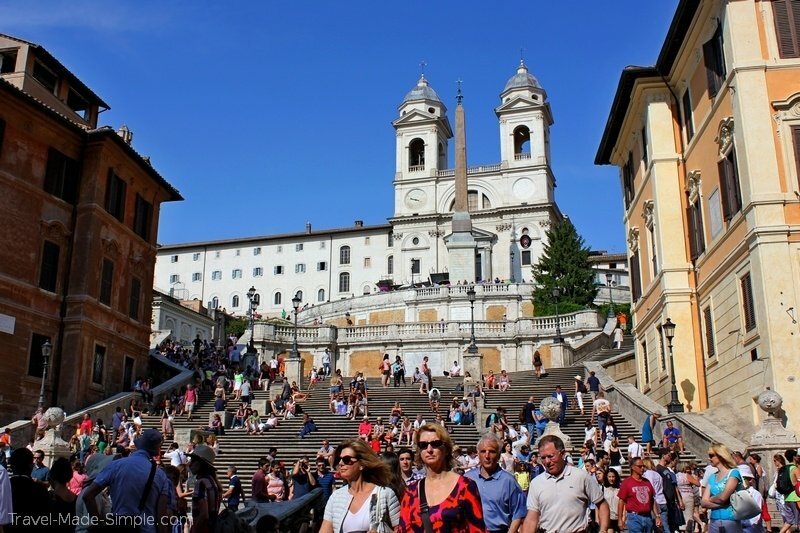 It is the widest staircase in Europe, and these steps were one of many sights made famous by the movie Roman Holiday. They’re a great place to sit and relax in between seeing the bigger sights. The most iconic image from Rome is the Colosseum, and a trip to Rome isn’t complete without visiting this landmark. Next door to the Colosseum is the Roman Forum, which is worth doing a tour of as well. It is a lot of being on your feet, but totally fascinating and worth it. It was built in just eight years, which is fascinating given how huge it is and how long ago it was built. It was the site of many gladiator battles put on as shows, but there is so much more to its history. I highly recommend taking a tour so you can hear the details while you’re there, and many of the tours will also allow you to skip the long lines to get in. We took this one, which gave us exclusive access to the underground area and the third tier for amazing views. 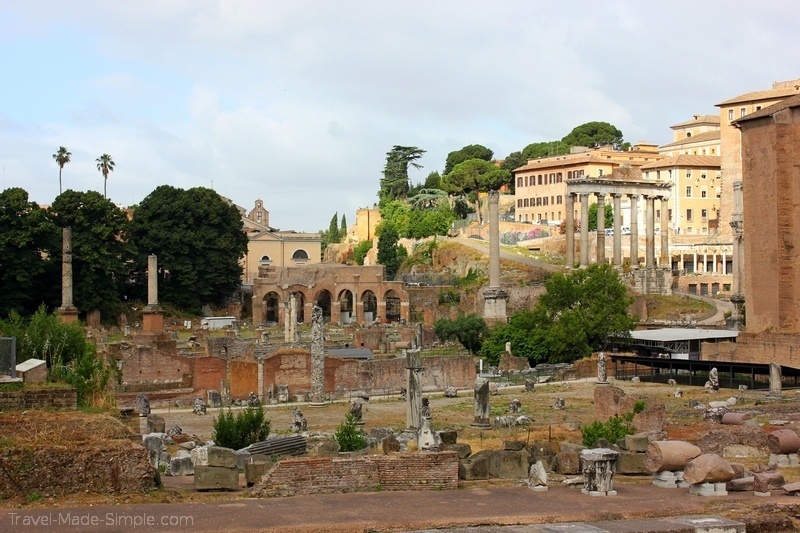 The Roman Forum is right next to the Colosseum and usually included on a tour of the Colosseum. At one time, this was the center of activity in the city. The ruins are constantly being excavated, so what you see now might look different if you return in 10 or 20 years. Just like with the Colosseum, there are so many tales of the history that took place in the Roman Forum that help bring it all alive when you’re there. Read my full review of the fun Underground Colosseum and Roman Forum tour Andy and I took in Rome. Especially in the summer, try to pick early tours to avoid some of the afternoon heat. Italy doesn’t have a siesta like in Spain, but the afternoon is definitely a slower time due to the heat. If you do the tour mentioned above, it ended around lunch time out from the Colosseum. Try not to eat right there, it is tourist-ville. Your food tour from yesterday should have given you an idea of at least one place to eat, so try to hunt that out. Especially if you didn’t get here yesterday, head across the river to the Trastravere neighborhood. Trastravere literally means “Across the Tiber” in Italian. The Tiber is the river that flows through the city. The banks of the river and the small island (Isle Tibertina) come alive in the summer evenings with bars and outdoor events. Rome doesn’t have any skyscrapers or tall towers to climb, but it does have Giancollo Hill. This hill in Trastravere is reached by bus 115 to stop Piazzale Garibaldi. There is a plaza with a good view over the old city. Find the footbridge called Ponte Sisto that leads from the north bank of the river where Campo Fiore into tiny Piazza Trilussa. Andy and I sat on the steps there with once warm evening and it was a lot of fun. Behind the piazza toward the east (left if you have the bridge at your back), is a large network of crisscrossing streets full of restaurants. If it is still early, wander your way to Fata Morgana Gelato (Via Roma Libera, 11, 00153 Roma RM, Italy). They have really tasty gelato in some crazy and interesting flavors. While technically a separate country (the smallest in the world), Vatican City is located entirely within the city of Rome. This is the seat of the Roman Catholic Church, but even if you’re not Catholic or religious, the art and history inside its tiny borders are well worth a visit. Consider a tour to get in to the Sistine Chapel ahead of the general public. We took this one, and it was so nice to get in before the crushing crowds. Read my full review of the Early Access Sistine Chapel and Vatican tour we took. Well worth waking up early for it! To the east of the Vatican back in the city of Rome proper stands the impressive fortress of Castel Sant’Angelo. Leading across the river from the main gate is the Sant Angelo bridge. Both of these were originally built in the 2nd century. The structure was built as the mausoleum of Emperor Hadrian, but has seen many uses both military and civil since then. Andy and I have personally taken these tours in Rome, and we highly recommend them. Especially if you visit in the hotter months, you might want to find a cafe and relax in the shade in the middle of the afternoon to avoid the hottest part of the day. Venture back out at night when things start to cool off. Nighttime in Rome is the perfect time for a leisurely stroll. Check out some ruins, grab a gelato, and remember that Italians typically eat dinner late, starting around 9pm. Read more on things to know about eating in Italy here. You can also take some nighttime tours in Rome. If you’re not a morning person, the early Sistine Chapel and Vatican tour might not appeal to you, but you can take a Sistine Chapel and Vatican night tour. And how cool would it be to do a tour of the Colosseum at night? If you’re up for something a little creepy, try the crypts and catacombs tour at night! Rome transforms at night. Though many of the tourist attractions in Rome are only open during the day, it’s worth saving some energy to wander around and experience this ancient city after the sun goes down. You can certainly visit Rome all year around, but some times are potentially better than others. Summer can be quite hot and comes with a higher number of cruise ships. Avoid August if you can. It is hot and muggy and most Italians are on vacation, which means lots of attractions in Rome might be closed. Winter can be cold and although rare, it is known to snow. Some businesses also take time off within the months of November to February. Our best times in Rome have been in the spring and fall, April, May, September, and October. The weather is warm, but not unbearable, and although there are still tourists, it isn’t the highest concentration. Easter time and Christmas can be busy though. We have stayed in several different areas in Rome, but one of our favorites was Trastevere. It’s across the river from the main sights but still not far away. The neighborhood does see its fair share of tourists but still manages to maintain a local vibe. Staying here will give you a glimpse of how the Romans live and a calmer escape after a day of sightseeing. Check availability and reviews for hotels in Trastevere. If you prefer to stay closer to the sights, you’ll want a neighborhood in the city center. You’ll find more selection north of the Colosseum, near other sights such as Piazza Navona, the Pantheon, and Trevi Fountain. Check availability and reviews for hotels in Rome’s city center. Rome is easily reached by either train or airplane. The main train station is called Roma Termini, but there are several others in the city. Termini has all of the long distance trains to the rest of Italy as well as the train out to the airport. TrenItalia is the national rail company. Check out our whole post on train travel in Italy. The international airport in Rome is called Fiumicino Airport. It is roughly 35 minutes from Termini and express trains run every 15 minutes at a cost of about 14 Euro. There are cheaper bus options, but they take longer. There is a second smaller airport, called Ciampino Airport, for budget airlines. Make sure you know which airport your flight is leaving from. Try booking trains in Italy and all over Europe using Omio (formerly GoEuro). It’s straightforward and all in English, and it can even show you bus and flight options. There are plenty of transport options inside the city of Rome. There are two main metro lines and a third being built. 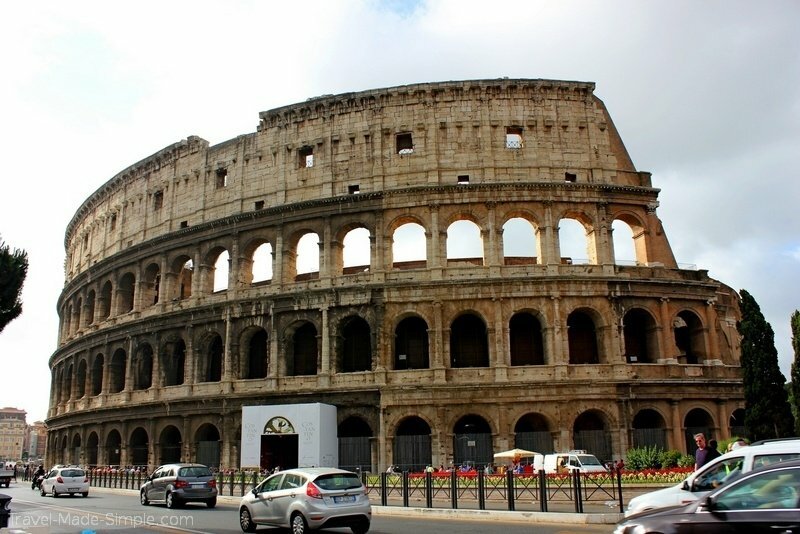 They do not always get close to the tourist sites, but there is a stop at the Colosseum and at the main train station. These are the fastest ways around Rome if there is a stop near where you are going. Next there is a system of trams. They are really only in the center, but do go across to Trastravere. And finally the bus system. There is a system of buses that go pretty much everywhere, but can be a real hassle. The routes don’t always make sense and, in our experience, drivers rarely know even basic info about their route, but if you know the route, they can be really handy. Since they don’t usually announce upcoming stops, pay attention to the bus stop signs along the way and know which stop comes before the one you want. Buy tickets ahead of time in tobacco shops or news stands. The buses usually don’t have ticket machines. 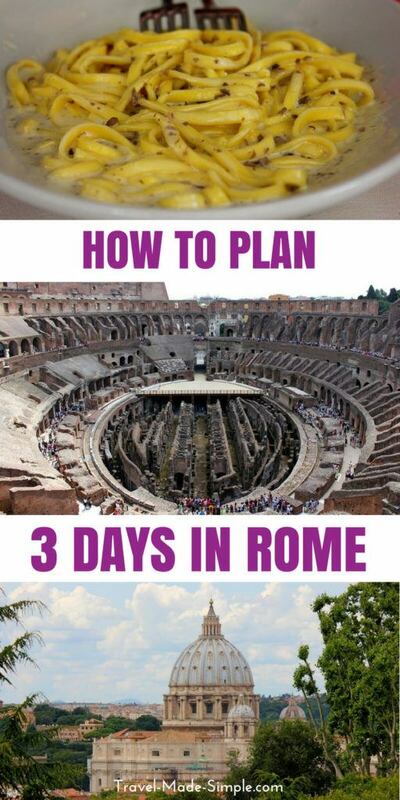 What if you have 4 days in Rome, or even a week? There are plenty of museums in Rome that can occupy you for a while, especially if you have more than 3 days in Rome. 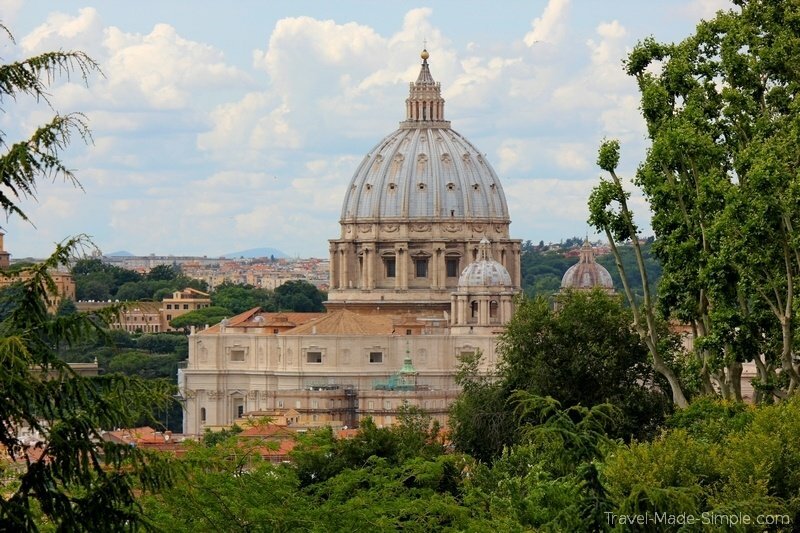 Try a tour of the Borghese Gallery and Gardens or a tour of Rome’s catacombs. Take both food tours listed above. Seriously, they are both unique in their own way. Search for all the best gelato in town. Or do some day trips from Rome. It sits roughly in the center of the country and a lot of stuff is reachable as a day trip. You could visit vineyards and taste wine from the surrounding region or take a bicycle tour of the Ancient Appian Way. If you’re willing to deal with a few hours on transportation, consider a day tour to Pompeii or a day tour to the Amalfi Coast. Or simply enjoy a more leisurely pace. Relax and soak up the ancient city of Rome from a cafe or by wandering the streets with no particular destination in mind. Your vacation in Rome can be a combination of activities and relaxation. There are so many other things to do in Rome. What I’ve listed here will give you a thorough introduction to the history and culture of this great city. But don’t just see the sights. Take some time to simply wander the streets and discover pieces of every day life in Rome. Sit in a piazza with a book and watch the world go by. Do as the locals do, and just enjoy! Thanks Siddhartha! Rome is a wonderful city! This makes me want to go back to Italy. And that photo of the pizza looks scrumptious!!! Thanks Lynda! Italy is a fantastic country, I hope you make it back there one of these days! I was in Rome for nine days and I loved it! I went to the Vatican Gardens, St Peters Basilica and Sistine Chapel and I feel I have to go for a repeat visit to these places. I went to the Musei Capitolini, but I didn’t see all of it because I was so tired from walking all morning, so I have to go again to see more. I’ve tried food at different restaurants, the food is amazing, I was going to the bar for my morning croissant and cappuccino and espressos throughout the day. I’ll definitely be back in Rome. Anne, I’m so glad you enjoyed Rome! It’s an amazing city. And there’s just soooo much to see! I’ve been there 3 times and still haven’t made it to a few major landmarks. Hopefully I’ll remedy that when I’m there in a couple weeks. I hope you enjoyed the other parts of Italy you visited too! 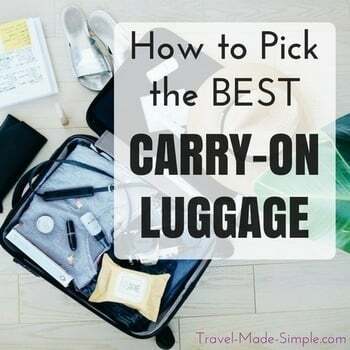 I am going to spend 4 days in Cyprus in the fall and stumbled on your packing tips while researching. I read online that Cyprus has the second busiest airport in Europe. Is it really that busy? Do you remember how long getting through Customs took? Hi Rachel, there’s no way Cyprus has the 2nd busiest airport in Europe. It’s a small airport, and tons of other ones around the continent (London has 2 airports, Munich, Frankfurt, Madrid, Barcelona, Paris has 2, Rome, Zurich, Amsterdam, and on and on…..) are all way busier than the one in Cyprus. Wikipedia says it was 69th last year. It took a few minutes to get through passport control, no worries.